This article is an amalgamation of two separate articles from the Mennonite Encyclopedia, both dealing with the Slavgorod Mennonite Settlement and written by Cornelius Krahn. The first article was published in 1953 under the name Barnaul Mennonite Settlement. A similar article dealing with the same settlement under the name Slavgorod Mennonite Settlement was published in 1959. The original articles can be found below under Additional Information. Slavgorod Mennonite Settlement, also known as Barnaul Mennonite settlement, is located in the Kulundian Steppes between the Irtysh and the Ob rivers in West Siberia, a part of the USSR in the Altai Territory (formerly Tomsk). The settlement was at first called Barnaul, since this was the only city in the area at the time of the settlement in 1907. In 1911, when the city of Slavgorod was established ten miles from the settlement, the settlement took this name. The Slavgorod Mennonite settlement was flanked by many other Mennonite settlements located in the vicinity of Omsk, Slavgorod, and Pavlodar. It was some 100 miles (160 km) south of the great Siberian railroad line between Omsk and Novo-Nikolaievsk (now Novosibirsk), 120 miles (195 km) north of Pavlodar on the Irtysh River and 10 miles (16 km) from the city of Slavgorod. In later years the city of Barnaul was connected by rail with the main line. Slavgorod (Barnaul) Settlement, Siberia, Russia. In the beginning of the 20th century this region, known as the Kulundian steppes, was desolate and inhabited only by nomads with herds of cattle. The first Mennonites in West Siberia were those in Akmolinsk near Omsk and Friesenov in 1897 ff. When the government in 1906 announced the availability of land in the Kulundian Steppes, Mennonites became interested and sent representatives from the settlements of Zagradovka, Ufa, Samara, and Orenburg. In the Orenburg settlement Heinrich Neumann and a Hiebert took the initiative and called a meeting for 20 August 1906, at which a committee of eight was elected. On 20 September, Heinrich Krüger and Jakob B. Peters were delegated to investigate the Kulundian Steppes. In October the two delegates reported about their findings. At the end of April Krüger and Peters were sent again to Siberia for final arrangements. Here they met with the following representatives from Zagradovka: Franz Buller, J. D. Wiebe, Abraham Dück, Isaac Friesen, and Jakob B. Peters. The Davlekanovo Mennonites of Ufa also had investigated the settlement possibilities and had been in touch with others. Jakob A. Reimer met Stolypin, who recommended the Barnaul for settlement. When Franz Buller was in St. Petersburg in the interest of this matter, he was asked to investigate land along the Amur River. The representative from Samara was Heinrich Lohrenz. Jakob B. Peters of Orenburg, Jakob A. Reimer of Ufa, and Isaac Friesen and Abraham Dück of Zagradovka continued the trip to the Amur region to investigate land. Upon their return, Reimer and Peters stopped in Barnaul to make arrangements for settlement in the Kulundian Steppes near Barnaul. In 1907 the first families from Orenburg arrived to start the Slavgorod settlement (some sources set the date as of 1909). Soon various settlers from the Zagradovka, Chortitza, Molotschna, and other Mennonite settlements located in this area. Each male member of the family received from the government 40 acres of land. The Mennonites followed their own method of distributing this land among themselves in farms of equal size. The families without any means received 400 rubles from the settlement funds of the mother colonies. The settlers were given a reduction in railroad fare to the place of settlement, were exempted from taxes for five years and from government services for three years, received a loan of 160 rubles and also a credit loan of 160 rubles, and the land free of charge. The beginnings were especially difficult because of the distance from the railroad. The nearest railroad stations and also the harbor of Pavlodar on the Irtysh River were 150 miles away. The settlers raised wheat, oats, and other grains. The winter set in early and lasted long, leaving a short season for raising the grains and harvesting them. Of the promised 160 rubles only 100 were actually paid out. The lumber for building had to be gotten from the royal forest about 70 miles away. It was hard to obtain even the essential food supplies such as flour until Mennonites established their own mills. The surrounding population consisted to a large extent of descendants of former Czarist exiles known as Chaldony. This population was extremely hospitable and honest, and of great help to the Mennonites in the pioneer days. In addition to these there were also the descendants of religious exiles such as the Baptists. Ukrainians and other Germans had also settled in this territory. The administration of the settlement was located in Orloff. In 1920 an additional administration district was established in Chortitza. The Orloff municipality of the Slavgorod settlement consisted of the following 26 villages: Gnadenfeld, Tiege, Lichtfelde, Schönwiese, Schönau, Schönsee, Nikolaidorf, Alexeyfeld, Reinfeld, Protassov, Schöntal, Grünfeld, Orloff, Rosenhof, Friedensfeld, Alexandrovka, Tchernovka, Rosenwald, Nikolaipol, Berezovka, Hochstädt, Ebenfeld, Blumenort, Gnadenheim, Kleefeld, and Shumanovka. The Chortitza municipality consisted of the following eight villages: Halbstadt, Alexanderkron, Karatal, Chortitza, Markovka, Grieshenka (Alexanderfeld), Stepncye, and Golenki. Besides the main Slavgorod settlement there were various smaller ones which increased from year to year. Thirty miles from Slavgorod, Fernheim, Sergeyevka, and Gnadental were established in 1910 with 38 farms each. In 1912 four more villages were established some 20 miles southeast of Slavgorod, namely, Nikolayevka, Silberfeld, Khoroshoye, and Saratov. In 1908 the Glyaden or Lichtfelde settlement, located 72 miles (115 km) east of Slavgorod, was established, consisting of Lichtfelde, Ebenfeld, Ivanovka, and Sluchaynoye. Another settlement, which was a part of the Slavgorod area in 1912, became known as Pashnya, located some 48 miles (78 km) east of Slavgorod. It consisted of the five villages of Grigoryevka, Markovka, Ananyevka, Ekaterinovka, and Zhelanovka. Another settlement was Tchayatchy (Tchaiatchi), located 42 miles (67 km) east of Slavgorod and consisting of the three villages of Nikolayevka, Alexeyevka, and Tatyanovka. Some settlers from here went to the Amur area in 1924. About 15 miles (25 km) to the west was the new settlement Bas Agatch with two villages, Dolinovka and Suvorovka. Svistunovo, 45 miles (72 km) east of Slavgorod, consisted of two villages, Dolinovka and Tchernyevka. In addition to these little settlements bordering on the Slavgorod settlement there were larger ones more distantly located from Slavgorod which were not necessarily a part of this settlement. Among them were the Pavlodar, the Minussinsk, the Omsk, the Friesenov, the Tchunaievka settlements and others. Eventually, 59 villages consisting of Mennonites from all the major settlements of European Russia were established in the Slavgorod settlement on some 162,000 acres (60,000 desiatinas). The Slavgorod settlement consisted in 1925 of some 58 villages with a population of 13,173. One of the outstanding early leaders of the Slavgorod settlement was Jakob A. Reimer from Zagradovka, who was its first mayor (Oberschulze) 1910-1914, and who was said to have been called "the Moses of the Mennonites" by an official in Petersburg. The municipality (volost) center was located in the village of Orloff. In 1917 the municipality was divided, with Chortitza as a second center. With the establishment of Slavgorod as a city and district, this also became a business and industrial center, which improved the conditions of the new settlement. The government representative was located here and supervised the establishment of the settlement. Stolypin, the premier of Russia, paid a visit to the Mennonites in 1910, which helped the development of the settlement. About two thirds of the population belonged to the Mennonite Church and most of the others to the Mennonite Brethren. Several families belonged to the Allianz-Gemeinde and the Adventists. The Mennonite Church was divided into five districts averaging 350 baptized members each in 1913: Orloff, Grünfeld, Reinfeld, Shumanovka, and Markovka. The elders in 1913 were Cornelius Harder, Jakob Gerbrandt (graduate of Bethel College), and Kornelius Wienss. Ministers were Anton Löwen, H. Sawatzky, Jakob Enns, and others. The church buildings were located in Schönsee, Grünfeld, Kleefeld, and Markovka. In Orloff the town hall was used for worship services and in some villages private homes. The Mennonite Brethren were similarly divided into five districts: Schöntal, Schönwiese, Alexandrovka, Gnadenheim, and Alexanderfeld. Elder Jakob Wiens of the Pavlodar settlement served as elder (1913). Ministers were Aaron Reimer, Peter Bärgen, Schmidt, Isaak Braun, and Abram Ratzlaff (1913). Meetinghouses were located in all the villages mentioned as districts and in Alexanderkron. In all villages elementary schools had been established and the instruction was given in the German and Russian languages. Originally the schoolhouses were primitive and only a few of the teachers had training or experience in teaching. Gradually schools were built in most of the villages and trained teachers were hired. Outstanding among the teachers were Jakob Wedel, Johann D. Friesen, Anton Löwen, and Johann Dyck. Annually two teachers' conferences took place at which lectures were given and common problems were discussed. In 1913 an organization planned and promoted the establishment of a secondary school. It is not known whether it ever materialized. The villages of the settlements were similar to those of the mother settlements in European Russia. Summer wheat was the predominant grain produced. The farms followed the four-field rotation system. Summer was short and much work had to be done during this time. Products were very cheap during the first years because of lack of markets and transportation facilities. Farm machinery had been brought along from the old settlements. The first industrial undertakings were the common blacksmith shop and carpenter shops in which the farm implements were repaired. J. Walde, Lichtfelde, had a wagon and fanning mill factory. Windmills and mills driven by horsepower were established in order to produce the necessary flour. In 1911 Abram Tjart erected a steam flour mill for $67,500, which was nationalized in 1923 by the Soviet government. Jacob Martens erected another steam flour mill in Alexandrovka. Some of the villages had grocery stores and other business enterprises: Franz Dyck in Orloff, Johann Abrahams in Rosenwald, Jacob Dyck in Slavgorod. Other businesses, such as farm machinery sales and mills, were established in Slavgorod. A Danish-Siberian company had numerous stores in the Mennonite and surrounding settlements. Co-operative stores, dairies, seed stores, etc., became common, particularly after the Revolution. The dairy cooperatives enabled the Mennonites to sell butter at a favorable price. In 1916 the Slavgorod Mennonite settlement was connected with the Trans-Siberian railroad by a branch line leading from Tatarskaya to Slavgorod, which was extended later to the city of Pavlodar. This was a great improvement for the settlement. The Slavgorod settlement built a hospital in Orloff village in 1911, in which Gerhard Fast served for a while as doctor. A number of midwives did significant work; for example, Mrs. David Thielmann, Mrs. Jacob Voth, and Mrs. Franz Derksen. In 1919 the Slavgorod orphanage was opened for 50 orphans in the village of Halbstadt. In addition to the many elementary schools there was a Zentralschule in Orloff and later for a while in Grishkovka and Schöntal. The judges of the volost court were Johann Fast and Andreas B. Siebert. The first secretary was Peter Renpenning. In 1916 the second volost was established in Chortitza so that the settlement was under two separate administrations. The first Oberschulze of Chortitza was Jacob Nickel, and the first secretary Peter Töws. In 1922 the two administrations of Orloff and Chortitza were merged with the neighboring Russian administrations. Thus the Mennonite self-administration came to a close. In 1927 a district government (rayon) was established in Halbstadt, which included all German settlers. Later this was discontinued. During World War I the young men of the Slavgorod settlement were drafted to serve in forestry and as hospital workers on the Caucasian front. In September 1916, 161 of the 200 men aged 42-43 were drafted and went to the Caucasus to serve in offices and hospitals. Some died of typhoid fever. The majority of the drafted men did forestry service. After the Revolution in 1917 most of the young men returned. Siberia was a battlefield between the White army led by Kolchak and the Red army, ending with a victory of the latter. Some Mennonites were drafted into the White army. After the Revolution the German settlers organized a Slavgorod section of the Union of German Citizens of Russia (Verband deutscher Bürger Russlands), of which Peter A. Friesen was the chairman. At this time there were some hopes that Siberia would become an independent country in which the German element would have its own state. When the Soviets gained power the Union was dissolved. In 1923 a section of the Allrussischer Mennonitischer Landwirtschaftlicher Verein (AMLV) was organized in Slavgorod with its headquarters in Orloff. As in European Russia the purpose was to promote agriculture and cultural objectives in general. The report made to the AMLV by H. Friesen, a representative of the Slavgorod Mennonite settlement, on 12 February 1922, stated that the total Mennonite population in December 1921 was 14,890; the city of Slavgorod had 254 Mennonites in a total German population of 30,500, consisting of Mennonites, Lutherans, and Catholics. He pointed out that in 1921 they had been able to send food to the Mennonite settlements of Samara and the Volga district to help the starving. By 1922 the situation had changed considerably; because of the heavy requisition of grain no seed wheat was left for 1923. American Mennonite Relief furnished aid. However, P. F. Froese's report given in August 1924 on the extended trip he made with other representatives of the AMLV, including Alvin J. Miller of the American Mennonite Relief, through the Mennonite settlements of Siberia and particularly Slavgorod, says that there was actual starvation, lack of clothing and bedding, machinery, horses, and cattle. His report, although not hopeless, was extremely gloomy, and indicated dire need. Some of this help was furnished when W. P. Neufeld and M. B. Fast of Reedley, California, collected clothing and sent it to Siberia via Vladivostok. The poverty-stricken non-Mennonite population was also helped by the American Mennonite Relief, through seed loans, wool, flax, and cotton, for the processing of which spinning wheels and looms were furnished (Unruh, 22). Decline and disruption was caused by the Revolution of 1917 and the ensuing civil war, crop failures, and the excessive expropriation of food stocks by the Soviet government. The American representative, Alvin Miller, and the president of the Russian Verband, Peter F. Froese, attended a meeting held in the Slavgorod settlement in 1924. The seat of the organization was transferred to Slavgorod. Gradually the Slavgorod Mennonites overcame the extreme crisis. In 1925 P. B. Epp reported that gradual improvement was noticeable. Particularly the co-operative organized in 1923 and the stimulation which came through the branch office and headquarters of the AMLV in Moscow did much to improve economic conditions. The settlement co-operated in the selective seed program and the establishment of co-operative dairy organizations. By 1925 the AMLV had 960 members in this area. Froese, who attended the local meeting in 1926, could report more optimistically about the conditions. Epp reported that a new spirit had seized the settlers; buildings were in progress and improvements and repairs were noticeable everywhere. J. Epp found 26 Fordson tractors acquired by the co-operatives. He still found some signs of "America fever," but only a few had left for Canada. In the 1930's this revival of personal initiative came to a close and a complete and radical collectivization program was inaugurated similar to that found everywhere in the Soviet Union. According to a report given by H. Friesen, a representative of the Mennonites of the Slavgorod settlement in 1922, this settlement was divided into seven rayons (districts) in 1917. The population was expected to deliver grain to the government regardless of what had been harvested. A general retrogression was noticeable, as is evidenced in the following table: in 1920 the settlement had 3,005 horses, 1,530 cows, 1,702 sheep, and 710 pigs; in 1927 there were only 1,752 horses, 1,205 cows, 1,600 sheep, and 515 pigs. Similar retrogression was reported in farm machinery. For education the barest necessities were not available. Confiscation, inflation, and various other policies of the newly established Soviet government, including the New Economic Policy (NEP), followed in rapid succession in Siberia. The NEP period was characterized by an increase in dairy organizations. However, by 1922 many were considering immigration to America. Two delegates were sent to Moscow in 1922 to inquire about the possibilities. Peter B. Epp, while attending a meeting of the Verband in Moscow in 1925, and others went to the GPU in the Lubyanka office to get information about emigration possibilities. Some Slavgorod families left in 1925. The following year a larger number followed. A committee was organized and an English physician came to examine the emigrants. Among those leaving were Elder Cornelius D. Harder and Peter B. Epp. The emigrants, which did not exceed 200, went to Canada and Mexico. Until 1925 the Mennonites continued private farming and ownership. In 1926 Grünfeld started collective farming. In 1927 other villages began to work most of their land collectively, though each retained some of his property. The government supported this effort by making tractors and threshing machines available. In 1928 radical collectivization was introduced and many of the Mennonite farmers exiled as kulaks. Ministers and churches were taxed to a degree that it was impossible to fulfill the obligations. Religious instruction to young people was prohibited. After 1928 the ministers were gradually exiled and the churches confiscated. Meanwhile Stalin introduced his five-year plan and with it sealed the fate of the farmers. Since the conditions became more difficult, a few farmers went to Moscow in 1929 hoping to obtain permission to leave the country. When they succeeded, large numbers followed them. Some received permission to leave, but the vast majority were returned in freight trains. Those who had sold everything had very difficult times. Most of those who emigrated finally got to Paraguay and settled in the Fernheim colony. In 1930-31 all the villages were organized as collective farms. Many farmers and families were exiled, and great numbers perished. A number of the European Russian Mennonites who were exiled to Siberia under Stalin's rule, or were evacuated eastward in 1941 when the Germans occupied the Ukraine, doubtless found their way to the Slavgorod settlement after completing their term as exiles. Letters received by relatives in America indicate this. A vivid description of conditions among the Slavgorod Mennonites is given by Klaus Mehnert in the article "Deutsche—vom Sturme verweht" (Der Bote, issues of 5, 12, 19 September 1956). He visited the Mennonites through the publication office of the paper Arbeit in Barnaul. He judges that in the Kulundian Steppes there are some 200,000 to 250,000 people of German background. He had an extensive visit on the collective farm composed of five Mennonite villages consisting of 289 families with 1,025 persons. The 571 workers are divided into three groups, one taking care of the farming, the second the animals, and the third the buildings, homes, sheds, etc. A considerable amount of virgin land had been added to the collective farm. The farm had 514 cows, 356 pigs, and 512 sheep, and had been distinguished at the Moscow agricultural exhibition. For 1955 the monthly wages of an individual were 257 rubles and 110 kilograms of grains. A. A. Friesen Collection, Mennonite Library and Archives (North Newton, Kansas). Anger, H. Die Deutschen in Sibirien. Reise durch die deutschen Dörfer Westsibiriens. Berlin and Königsberg, 1930. Behrends, Ernst. Beata. Heilbronn, 1935. Fast, Gerhard. In den Steppen Sibiriens. Rosthern, 1957: 27. Fast, M. B. Geschichtlicher Bericht wie die Mennoniten Nordamerikas ihren armen Glaubensgenossen in Russland jetzt und früher geholfen haben. Reedley, 1919. Hege, Christian and Christian Neff. Mennonitisches Lexikon, 4 vols. Frankfurt & Weierhof: Hege; Karlsruhe: Schneider, 1913-1967: v. I, 125. Hiebert P. C. and O. O. Miller. Feeding the Hungry. Russia Famine 1919-1925. Scottdale, 1929: 313 ff., 390. Hildebrand, John J. Sibirien. . . Winnipeg, MB: Hildebrand, 1952. Loewen, A. and A. Friesen. Die Flucht über den Amur. Steinbach, 1946. Quiring, Jacob. Die Mundart von Chortitza in Süd-Russland. München: Druckerei Studentenhaus München, Universität, 1928: 39-41. Unruh, H. "Die Mennonitischen Ansiedlungen in West-Sibirien." Bundesbote-Kalender (1913). Unruh, John D. In the Name of Christ. Scottdale, 1952. Unser Blatt I: 45, 128, 279, II: 182, 208, 210, 277, III: 11-13, 15-16. Barnaul (also Slavgorod), a Mennonite settlement named after the city of Barnaul on the Ob River in the Altai district in West Siberia, formerly the province of Tomsk. The Barnaul Mennonite settlement was flanked by many other Mennonite settlements located in the vicinity of Omsk, Slavgorod, and Pavlodar. It was some 100 miles (160 km) south of the great Siberian railroad line between Omsk and Novo-Nikolaievsk (now Novosibirsk), 120 miles (195 km) north of Pavlodar on the Irtysh River and 10 miles (16 km) from the city of Slavgorod. In later years the city of Barnaul was connected by rail with the main line. In the beginning of the 20th century this region, known as the Kulundian steppes, was desolate and inhabited only by nomads with herds of cattle. The first Mennonites in West Siberia were those in Akmolinsk near Omsk and Friesenov in 1897 ff. In 1906 landless Mennonites of the Orenburg Mennonite settlement organized to locate land for settlement purposes in West Siberia. Heinrich Krüger and Jakob Peters were sent as delegates to study land and conditions under which a settlement could be made. They met in West Siberia with delegates from other Mennonite settlements in the Ukraine and together made arrangements with the government to reserve for them some 60,000 dessiatines (162,000 acres) of land near Barnaul. In 1907 the first families from Orenburg arrived to start the Barnaul settlement (some sources set the date as of 1909). Soon various settlers from the Zagradovka, Chortitza, Molotschna, and other Mennonite settlements located in this area. Each male member of the family received from the government 40 acres of land. The Mennonites followed their own method of distributing this land among themselves in farms of equal size. The families without any means received 400 rubles from the settlement funds of the mother colonies. The pioneer conditions were very hard. The crops were fair, but the market was far away and poor. One of the outstanding early leaders of the Barnaul settlement was Jakob A. Reimer who was its first mayor (Oberschulze) 1910-1914, and who was said to have been called "the Moses of the Mennonites" by an official in Petersburg. The municipality (volost) center was located in the village of Orlov. In 1917 the municipality was divided, with Chortitza as a second center. The Barnaul settlement consisted in 1925 of some 58 villages with a population of 13,173. 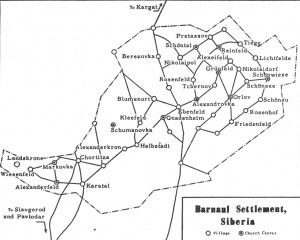 Most of these villages belonged to the Barnaul settlement proper. However, as time went on the families increased and more settlers arrived and numerous smaller settlements sprang up on the fringes of this settlement. The Orlov municipality of the Barnaul settlement consisted of the following 26 villages: Gnadenfeld, Tiege, Lichtfelde, Schönwiese, Schönau, Schönsee, Nikolaidorf, Alexeyfeld, Reinfeld, Protassov, Schöntal, Grünfeld, Orlov, Rosenhof, Friedensfeld, Alexandrovka, Tchernovka, Rosenwald, Nikolaipol, Berezovka, Hochstädt, Ebenfeld, Blumenort, Gnadenheim, Kleefeld, and Shumanovka. The Chortitza municipality consisted of the following eight villages: Halbstadt, Alexanderkron, Karatal, Chortitza, Markovka, Grieshenka (Alexanderfeld), Stepnoye, and Golenki. Besides the main Barnaul settlement there were five smaller ones which increased from year to year. About 15 miles (25 km) to the west was the new settlement Bas Agatch with two villages, Dolinovka and Suvorovka. Svistunovo, 45 miles (72 km) east of Slavgorod, consisted of two villages, Dolinovka and Tchernyevka. Tchaiatchi with the two villages, Nikolayevka and Tatianovka, was located 42 miles (67 km) east of Slavgorod. Gliaden, located 72 miles (115 km) east of Slavgorod, consisted of five villages, while Pashvia was located some 48 miles (78 km) east of Slavgorod consisting of four villages, Ananyevka, Markovka, Ekaterinovka, and Grigoryevka. In addition to these little settlements bordering on the Barnaul settlement there were larger ones more distantly located from Barnaul which were not necessarily a part of this settlement. Among them were the Pavlodar, the Minussinsk, the Omsk, the Friesenov, the Tchunaievka settlements and others. The Mennonite Church was divided into five districts averaging 350 baptized members each in 1913: Orlov, Grünfeld, Reinfeld, Shumanovka, and Markovka. The elders in 1913 were Kornelius Harder, Jakob Gerbrandt (graduate of Bethel College), and Kornelius Wienss. Ministers were Anton Löwen, H. Sawatzky, Jakob Enns, and others. The church buildings were located in Schönsee, Grünfeld, Kleefeld, and Markovka. In Orlov the town hall was used for worship services and in some villages private homes. Most of the village occupants were farmers. The farms averaged 135 acres. Of each farm a few acres were set aside to be rented out. The income formed a fund to be used to buy land for the next generation. There were nine stores, four windmills, two steam mills, one motor mill, and a number of smith and carpenter shops located in the various villages. In Orlov the government erected a hospital and a post office. During World War I most of the men were drafted, which handicapped the normal development and progress of the new settlement considerably. After the Revolution the great poverty of the settlement was somewhat relieved through American Mennonite help. Until 1925 the Mennonites continued private farming and ownership. In 1926 Grünfeld started collective farming. In 1927 other villages began to work most of their land collectively, though each retained some of his property. The government supported this effort by making tractors and threshing machines available. In 1928 radical collectivization was introduced and many of the Mennonite farmers exiled as kulaks. Ministers and churches were taxed to a degree that it was impossible to fulfill the obligations. Religious instruction to young people was prohibited. After 1928 the ministers were gradually exiled and the churches confiscated. Thus collectivization, exile, and the entire religious policy of Communism broke the Mennonite way of life. However, the settlement was completely disintegrated as was the case with most of those in European Russia. Hardly any Mennonites from Siberia had been fortunate enough to leave Russia and to come to America by the 1950s. The Settlement. When the government in 1906 announced the availability of land in the Kulundian Steppes, Mennonites became interested and sent representatives from the settlements of Zagradovka, Ufa, Samara, and Orenburg. In the Orenburg settlement Heinrich Neumann and a Hiebert took the initiative and called a meeting for 20 August 1906, at which a committee of eight was elected. On 20 September, Heinrich Krüger and Jakob B. Peters were delegated to investigate the Kulundian Steppes. In October the two delegates reported about their findings. At the end of April Krüger and Peters were sent again to Siberia for final arrangements. Here they met with the following representatives from Zagradovka: Franz Buller, J. D. Wiebe, Abraham Dück, Isaac Friesen, and Jakob B. Peters. The Davlekanovo Mennonites of Ufa also had investigated the settlement possibilities and had been in touch with others. Jakob A. Reimer met Stolypin, who recommended the Barnaul for settlement. When Franz Buller was in St. Petersburg in the interest of this matter, he was asked to investigate land along the Amur River. The representative from Samara was Heinrich Lohrenz. Jakob B. Peters of Orenburg, Jakob A. Reimer of Ufa, and Isaac Friesen and Abraham Dück of Zagradovka continued the trip to the Amur region to investigate land. Upon their return, Reimer and Peters stopped in Barnaul to make arrangements for settlement in the Kulundian Steppes near Barnaul. Fifty-nine villages consisting of Mennonites from all the major settlements of European Russia were established in the Slavgorod settlement on some 162,000 acres (60,000 dessiatines). They were given a reduction in railroad fare to the place of settlement, were exempted from taxes for five years and from government services for three years, received a loan of 160 rubles and also a credit loan of 160 rubles, and the land free of charge. The beginnings were especially difficult because of the distance from the railroad. The nearest railroad stations and also the harbor of Pavlodar on the Irtysh River were 150 miles away. The settlers raised wheat, oats, and other grains. The winter set in early and lasted long, leaving a short season for raising the grains and harvesting them. Of the promised 160 rubles only 100 were actually paid out. The lumber for building had to be gotten from the royal forest about 70 miles away. It was hard to obtain even the essential food supplies such as flour until Mennonites established their own mills. An outstanding leader of the pioneer days was the Oberschulze Jacob A. Reimer, from Zagradovka. With the establishment of Slavgorod as a city and district, this also became a business and industrial center, which improved the conditions of the new settlement. The government representative was located here and supervised the establishment of the settlement. Stolypin, the premier of Russia, paid a visit to the Mennonites in 1910, which helped the development of the settlement. The original settlement consisted of 36 villages. Later additional border settlements were added consisting of three to five villages each. Thirty miles from Slavgorod, Fernheim, Sergeyevka, and Gnadental were established in 1910 with 38 farms each. In 1912 four more villages were established some 20 miles southeast of Slavgorod, namely, Nikolayevka, Silberfeld, Khoroshoye, and Saratov. In 1908 the Glyaden or Lichtfelde settlement, with four villages, originated some 80 miles from Slavgorod, consisting of Lichtfelde, Ebenfeld, Ivanovka, and Sluchaynoye. Another settlement, which was a part of the Slavgorod area in 1912, became known as Pashnya and consisted of the five villages of Grigoryevka, Markovka, Ananyevka, Ekaterinovka, and Zhelanovka. The location was about 70 miles from Slavgorod. Another settlement was Tchayatchy, consisting of the three villages of Nikolayevka, Alexeyevka, and Tatyanovka. Some settlers from here went to the Amur area in 1924. Agriculture and Industry. The villages of the settlements were similar to those of the mother settlements in European Russia. Summer wheat was the predominant grain produced. The farms followed the four-field rotation system. Summer was short and much work had to be done during this time. Products were very cheap during the first years because of lack of markets and transportation facilities. Farm machinery had been brought along from the old settlements. The first industrial undertakings were the common blacksmith shop and carpenter shops in which the farm implements were repaired. J. Walde, Lichtfelde, had a wagon and fanning mill factory. Windmills and mills driven by horsepower were established in order to produce the necessary flour. In 1911 Abram Tjart erected a steam flour mill for $67,500, which was nationalized in 1923 by the Soviet government. Jacob Martens erected another steam flour mill in Alexandrovka. From World War I to World War II. During World War I the young men of the Slavgorod settlement were drafted to serve in forestry and as hospital workers on the Caucasian front. In September 1916, 161 of the 200 men aged 42-43 were drafted and went to the Caucasus to serve in offices and hospitals. Some died of typhoid fever. The majority of the drafted men did forestry service. After the Revolution in 1917, most of the young men returned. Siberia was a battlefield between the White army led by Kolchak and the Red army, ending with a victory of the latter. Some Mennonites were drafted into the White army. In 1923 a section of the All-Russischer Mennonitischer Landwirtschaftlicher Verein (AMLV) was organized in Slavgorod with its headquarters in Orloff. As in European Russia the purpose was to promote agriculture and cultural objectives in general. The report made to the AMLV by H. Friesen, a representative of the Slavgorod Mennonite settlement, on 12 February 1922, stated that the total Mennonite population in December 1921 was 14,890; the city of Slavgorod had 254 Mennonites in a total German population of 30,500, consisting of Mennonites, Lutherans, and Catholics. He pointed out that in 1921 they had been able to send food to the Mennonite settlements of Samara and the Volga district to help the starving. By 1922 the situation had changed considerably; because of the heavy requisition of grain no seed wheat was left for 1923. American Mennonite Relief furnished aid. However, P. F. Froese's report given in August 1924 on the extended trip he made with other representatives of the AMLV, including Alvin J. Miller of the American Mennonite Relief, through the Mennonite settlements of Siberia and particularly Slavgorod, says that there was actual starvation, lack of clothing and bedding, machinery, horses, and cattle. His report, although not hopeless, was extremely gloomy, and indicated dire need. Confiscation, inflation, and various other policies of the newly established Soviet government, including the New Economic Policy (NEP), followed in rapid succession in Siberia. The NEP period was characterized by an increase in dairy organizations. However, by 1922 many were considering emigration to America. Two delegates were sent to Moscow in 1922 to inquire about the possibilities. Peter B. Epp, while attending a meeting of the Verband in Moscow in 1925, and others went to the GPU in the Lubyanka office to get information about emigration possibilities. Some Slavgorod families left in 1925. The following year a larger number followed. A committee was organized and an English physician came to examine the emigrants. Among those leaving were Elder Cornelius A. Harder and Peter B. Epp. The emigrants, which did not exceed 200, went to Canada and Mexico. Krahn, Cornelius. "Slavgorod Mennonite Settlement (Siberia, Russia)." Global Anabaptist Mennonite Encyclopedia Online. 1959. Web. 23 Apr 2019. http://gameo.org/index.php?title=Slavgorod_Mennonite_Settlement_(Siberia,_Russia)&oldid=146724. Krahn, Cornelius. (1959). Slavgorod Mennonite Settlement (Siberia, Russia). Global Anabaptist Mennonite Encyclopedia Online. Retrieved 23 April 2019, from http://gameo.org/index.php?title=Slavgorod_Mennonite_Settlement_(Siberia,_Russia)&oldid=146724. Adapted by permission of Herald Press, Harrisonburg, Virginia, from Mennonite Encyclopedia, Vol. 1, pp. 235-236; vol. 4, pp. 540-542. All rights reserved.